Face shot of my one year old Skuzzy. Wonderful photo....I just love the look on his face....magnificiently captured! The tongue definitely adds a certain appeal....great job! I just love this shot to pieces. It is so CRISP, it is like you can reach out and touch Skuzzy! The tongue adds a sweetness to it. i really liked this shot and gave it an 8. congrats on the strong outcome. So much personality here that you've captured well. The details and color are great. Cats, babies, flowers and sunsets - the four hardest things to shoot because it's been done to death. 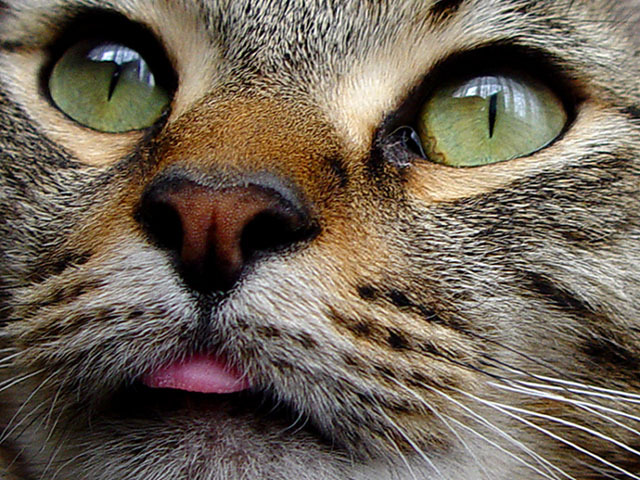 I love LOVE the tongue sticking out and the intent look in the cat's eyes. I don't like the reflection - it's very distracting. Very nice looking cat and picture. Tough subject - 9.
wonderful! great focus and perfect crop. well done! The tongue is great. Very good closeup. Very clear and well composed. What a cutie pie! And that tongue!!! lol My cat does that too. nice shot of your cat. I like the pink tongue and the eyes, the nose, actually I like everything about the face. Good focus, good lighting - natural? If you don't mind me saying so - what you have to be careful about Pet photos - remember to clean their eyes before you get too close - a lot of people don't like looking at the messy eye yuck! I love the tongue - you've named this perrrrfectly (I couldn't resist). Beautiful image with great detail and emotion. I taut' I taw' a putty'tat..... I did....I did..... Love the pink tongue! Super color and detail. Nice job! I wish I could vote - this would definitely rate 10. Cutie, love the tongue. He's got a bit of an eye bogger that I wish you had cleaned out before shooting, also wish both eyes were completely focused. Otherwise a great, fun shot. Great subject, sharpness and composition. Well done. Proudly hosted by Sargasso Networks. Current Server Time: 04/20/2019 02:40:44 AM EDT.